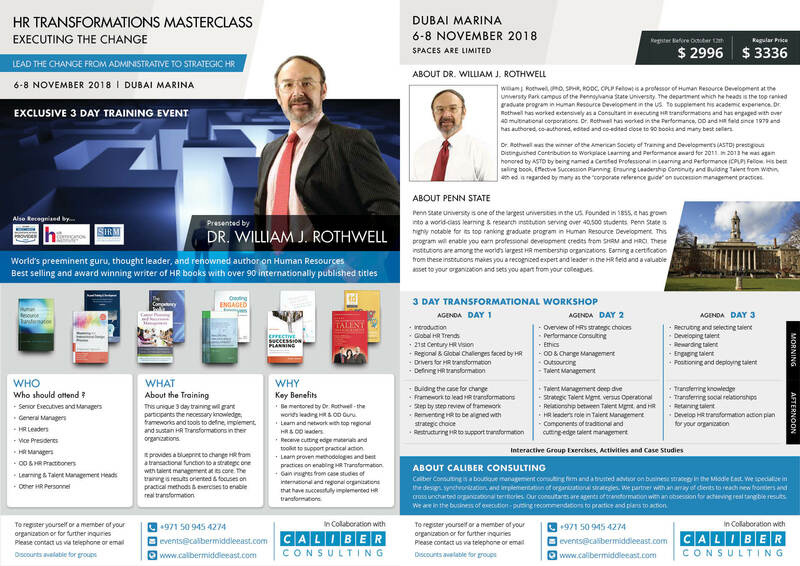 This training will be conducted by renowned HR thought leader and author of over 90 books- Dr. William J. Rothwell. He is also a professor at Pennsylvania State University, a top 100 global business school and heads the department which conducts the top ranked graduate program in Human Resource Development in the US. This MasterClass focuses on defining, planning, and implementing change in the HR function that ultimately enables business strategy and drives high performance. It focuses on making the change from a transactional HR function to one which is transformational and more strategic. The course takes a very practical approach to transformation and culminates with participants developing transformation plans for their own organizations. Don’t miss your chance to enroll in this course and start making change happen in your organizations. Contact: events@calibermiddleeast.com or call +971 50 945 4274 for more details and registration (spaces are limited).